The idea behind the HotelTechAwards is simple: the best companies are not defined by their size, funding rounds or number of press mentions - the best companies are the ones with the happiest customers. We designed the HotelTechScore to identify companies with the happiest customers and last year more than 100 companies competed for the industry's only data driven award that recognizes companies who excel in the eyes of the judges who matter most - their clients. The HotelTechScore (and respective ranking) is generally a good indicator of your position in the category throughout the competition; however, there is one scoring variable not factored into the HotelTechScore which will be used to determine winners. Just as HotelTechReport has an average review threshold - during the HotelTechAwards there will be a 120-day average review threshold to meet. This will not be displayed on the site but we will notify everyone halfway through the race to check-in. This variable ensures that new entrants have an even playing field with those who participated in previous years. Even some of the best companies sometimes struggle to get client reviews so we set out to solve that problem. Namely, we want to help our valued partners save time and simplify the review gathering process across their organizations - the review manager was born. Teams who collaborated with at least 3 client service reps to gather reviews obtained on average 5x more reviews than those with only 1 Hotel Tech Report account manager. Teams who gamified or incentivized review gathering for their customer success teams were all top performers (e.g. $50 Amazon card to the rep with the most reviews in a month). Based on these findings we built tools into the dashboard that make it easy for teams to gather reviews and manage the process. 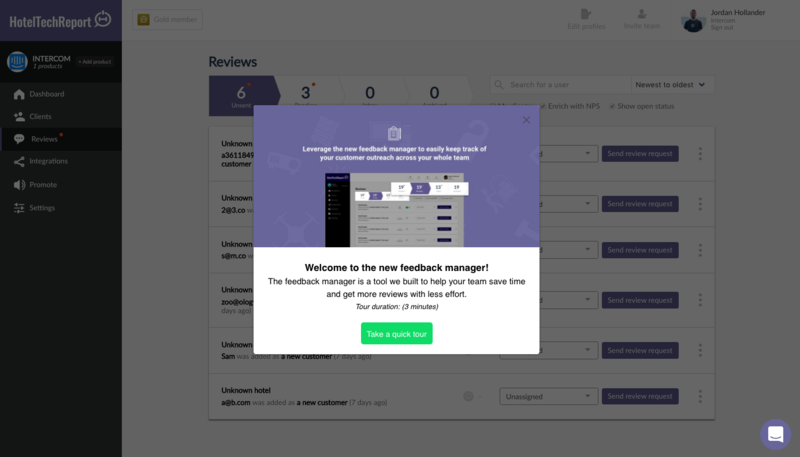 We built the review manager to help you send and track personal notes to clients. You can track opens/clicks to make sure you're not bombarding clients then follow up when the time is right. You can track requests through a funnel: unsent, sent, replied and even snooze clients so your team doesn't reach out to them. We built team collaboration tools so that you can track outreach as a team to make sure you're not doubling up on clients. You can tag team members and leave private notes for them on client files. You even have access to a leaderboard so your marketing team can manage outreach throughout the process. We built a lightweight and super affordable NPS tool so that companies not yet tracking satisfaction could get a pulse on client sentiment in real time without breaking the bank. Start early, don't procrastinate - getting reviews takes time! If you haven't already - head to your profile dashboard and take the quick tour of these new features. Best of Luck!